By kindergarten, children already care about their public image. Don’t worry; psychologists believe that’s a good thing. In a review published earlier this week in the journal Trends in Cognitive Sciences, psychologists Ike Silver and Alex Shaw found that five-year-old children are already considering how their behavior and interactive experiences, like sharing toys, working as a team and listening to their teacher, affects their reputation. These children were also found to modify their behavior to better their image, depending on the observer. 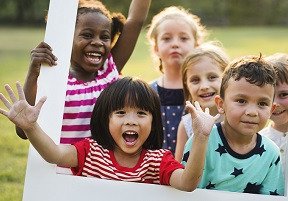 For example, researchers believe that young children modify their behavior to “appear moral or socially good” in front of certain groups of people. Silver and Shaw also report that when researchers told a group of preschoolers and kindergarteners that they had a good reputation in the eyes of their classmates, they were less likely to cheat when tempted than classmates who were not told of their good reputation. "Psychologists have been long interested in how we construct our identities and the sorts of strategies that we use to present ourselves in society," Shaw said in a statement. "We're finding that the kinds of complex and strategic self-presentation behavior we see in adults appear at a much younger age than previously known." What Silver and Shaw say isn’t yet known is just how young children are when first become aware of their public image. It seems it never too early to begin modeling good behavior it front of our nieces and nephews. After all, we need to keep up that good Savvy Auntie reputation.